"one infinite pure and holy – beyond thought beyond qualities I bow down to thee". Swami Vivekananda was a true nationalist in heart and spirit. He believed that there is one all dominating principle manifesting itself in the life of each nation. He said, “in each nation, as in music , there is a main note, a central theme, upon which all others turn. Each nation has a theme, everything else is secondary India’s theme is religion. Social reform and everything else are secondary. Like Sri Aurobindo and Bipin Chandra Pal, Swami Vivekananda advocated for religious basis of nationalism. Spirituality or religion was not to be confused with rituals, social dogmas, ecclesiastical formulations and obsolete costumes. By religion Vivekananda understood the eternal principles of moral and spiritual advancement. He believed in universal toleration and not in social and religious imposition. Therefore he can’t be charged with sectarianism or communalism. Vivekananda felt that Indian nationalism had to be built on the stable foundation of the post historical heritage. In the past, the creativity of India expressed itself mainly and dominantly in the sphere of religion. Religion in India has been a creative force of integration and stability. When the political authority had become loose and weak in India, it imparted event to that a force of rehabilitation. Hence, he declared that the national life should be organized on the basis of the religions idea. As supporter of this idea, he revived the eternal things of the Vedas and Upanishads to strengthen nation’s growth and faith in its individuality. Vivekananda’s soul like that of Bankim was lit with the luminous vision of mother India as a deity. To him, India didn’t just mean either a geographical entity or a heaven of opportunity for the elite. Hence Vivekananda worked for awakening the masses, the development of their physical and moral strength and creating in them a consciousness of the pride in the ancient glory and greatness of India. It is therefore he was hailed as one of the great architects of modern nationalism in India. In the words of Dr. Rao, “patriotism means love of the country and country means its masses. Only Vivekananda arrived at this road through religion”. Vivekananda was an ardent patriot and he had tremendous love for the country. He was the embodiment of emotional patriotism. A nation is composed of individuals. Hence Vivekananda stressed that noble virtues like manliness, a sense of human dignity and honor should be cultivated by all individuals. These individualistic qualities had to be supplemented with a positive sense of love for the neighbor. Without deep sense of selfless service it was mere prattle to talk about national cohesion and fraternity. It was essential to identify one’s ego with the ego of country and the nation. As a theorist and teacher Vivekananda has given to the country the idea of fearlessness and strength. His outstanding legacy was that he reconciled life and religion and sometimes gave a national, almost pragmatic definition of religion : “strength is religion”. 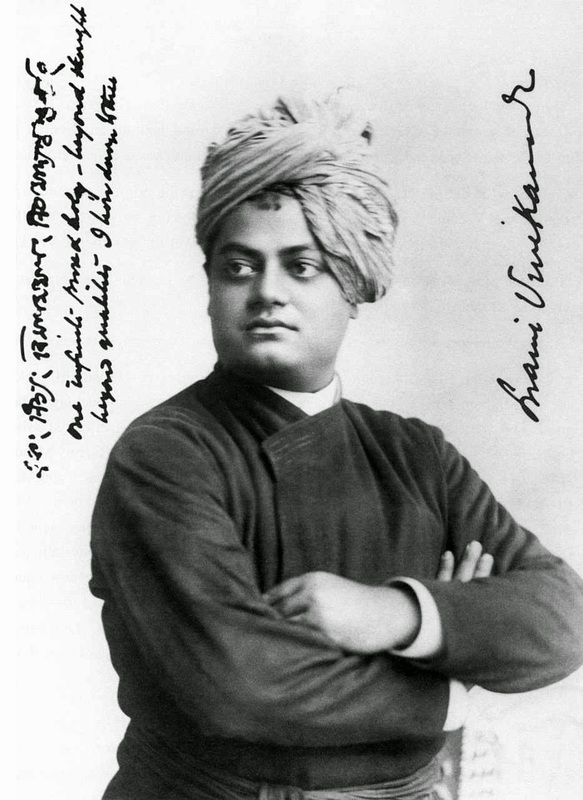 Vivekananda declared, “the essence of my religion is strength. The religion that doesn't infuse strength into the heart is no religion to me, be it of the Upanishads, the Gita or the Bhagavatam. Strength is greater than religion and nothing is greater than strength. Vivekananda didn’t pursue the negative policy of condemning the tyrannical, political and economic system that was in operation in India but positively stressed the cultivation of strength. He didn’t openly advocate the cause of India’s political emancipation. He couldn’t do so for two reasons. Firstly, he was a Sanyasi and didn’t want to get involved in political and legal controversies. Secondly, in those days the British imperialistic was firmly entrenched in India. If Vivekananda would have openly advocated the cause of political autonomy, he was sure to meet with imprisonment. That would have meant loose of his energy and detraction from the work that was dearest to his heart- the moral and religious regeneration of his country-men. Although Vivekananda didn’t openly advocate any protestant theory of Indian nationalism in opposition to British imperialism, he was intensely devoted to the cause of the emancipation of the poor and the downtrodden. With the advent of Indian freedom movement, the study of the Indian nationalism had assumed great importance. By that time Vivekananda’s writings and speeches had contributed a good deal to the strengthening of the moral foundations of Bengal nationalism in theory and practice. In fact, through his writings he imparted among the nationalists a sense of pride in the past and gave a cultural confidence to people who had lost their self- esteem. At a time when the Indian intelligentsia was busy imitating the westerners, Vivekananda boldly proclaimed that the west had to learn much from India. To understand the genesis of the Indian national movement, it is highly essential to read the political literature between 1904 to 1907 which is full of the gospel and writings of Vivekananda.